This may sound cheeky and cute but unfortunately for us, it is tragically true! We are still reeling in disbelief from a massive ice storm two weekends ago. In the middle of April. APRIL! Luckily we finally experienced sunshine and warmer temperatures this past weekend. It was glorious! Nonetheless, budding tulips and small icy patches of snow still coexist in the gardens outside, not letting us forget quite yet. Sprinter or not, though, I can slurp back a cozy bowl of noodle soup in any weather. Noodles are LIFE. These BLACK GARLIC SOBA NOODLE BOWLS are a cinch to make. The secret ingredient that elevates it from your everyday noods bowl is...that's right, BLACK GARLIC. For those uninitiated, it is basically a regular bulb of white garlic cooked low and slow for weeks at a controlled temperature. The resulting "Maillard reaction" causes a form of "non-enzymatic browning", hence the blackened cloves you see in the images. What's more is that black garlic is SUPER NUTRITIOUS. It has higher concentrations of antioxidants and the compound that is believed to lower cholesterol and decrease the risk of cancer, compared to white garlic. Woah, what is this wizardry right? I know I know, you also want me to tell you about the taste. Of course! That's the best part! The impression some people get based on their appearance is that black garlic is punch-in-the-face pungent and unpleasant. But the complete opposite is true. Black garlic has a sublimely mellow taste with notes of smokiness, sweetness, tang (think aged balsamic vinegar) and an overall umami. The texture is soft, slightly sticky and chewy. It has none of the unpleasant odor of white garlic. You can even think of it as a gummie candy for sophisticated palettes. Without the bad breath! (People DO in fact pop them in their mouths like candy). All of this wrapped into a tiny clove which adds a beautiful subtle complexity. In fact, I found that it is better not to overpower their flavor with other competing or too-strong ingredients. It's best to keep the ingredients simple to allow the black garlic's gentle complex flavor and aroma to sing. That is exactly what I had in mind coming up with this recipe. I wanted to keep it simple in order to properly appreciate this special ingredient that I was absolutely over the moon excited to find in my PC Black Label black box. In the box was also a jar of goose fat from France (perfect for roasted potatoes and sauteed green beans etc) and a jar of Ras El Hanout, a classic spice blend that hails from North Africa. So thrilling! I can't wait to play with them. If you live in Canada, you can always join me and #PlayWithYourFood too with PC Black Label products like these - it's like a mini culinary world tour with these ingredients. Major swooning and heart eyes galore. Whether you’re a home chef or an aspiring foodie, the PC Black Label Collection helps you unleash your culinary curiosity to create unexpected food experiences with new tastes and flavors. Discover the entire collection and be inspired to #PlayWithYourFood at pc.ca/blacklabel. People tell me they're intrigued but intimidated to try black garlic. But I promise, it doesn't need to be complicated. At least that's the kind of cooking I prefer - the easy kind. And I'm gonna guess you like easy mode too. Literally, for this recipe I just blended up black garlic cloves with broth to add immediate depth and subtle complexity. It made the broth SO DAMN GOOD. You think you can handle that? Yes you can. I belieb I mean believe in you. Then I topped the noodles with one of my favorite greens, pea shoot leaves (other Chinese greens like baby bok choy would also be very excellent) and a gooey, jammy egg. So nourishing! I've also got a growing list of things I want to make with black garlic, including hummus, sauces, marinades, meatballs and on and on. People even spread it on toast or as I mentioned, eat it straight up as a snack! It's such a versatile ingredient. 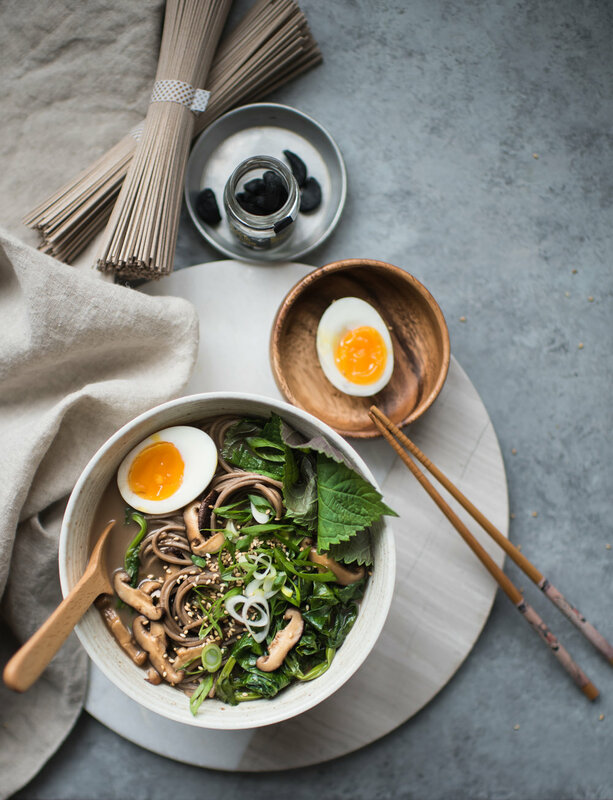 I hope you decide to try this BLACK GARLIC SOBA NOODLE BOWL recipe...it's too easy and too delicious to miss out on! Place a small pot with 1" of water over medium high heat until the water comes to a boil. Place the eggs in the pot and cover. Turn the heat down to maintain a simmer. Simmer for 6.5 minutes. Immediately run the eggs under cold running water for at least 30 seconds to stop the cooking. Peel, cut in halves and set aside for serving. Place black garlic cloves and broth in a blender and blend until there are no lumps of garlic remaining. Set a large pot with water over high heat and bring it to a boil. The noodles will be cooked in this pot later. Set a second large pot over medium heat. Once hot, add a drizzle of oil, the ginger slices and scallions. Saute to flavor the oil and soften the scallions a wee bit, like 20 seconds. Add the sliced shiitake mushrooms and move them around to brown up a bit. Next, add the snow pea leaves and season everything with salt to taste. Continue sauteing everything for a minute or two. Pour the black garlic broth into the pot, put the lid on and bring it to a simmer. Taste and add salt to taste - keeping in mind it should taste salty enough even when the noodles are added. Once the snow pea leaves are softened (the stems should be tender but still retain a slight crunch), turn off heat and keep warm over residual heat. Meanwhile, the noodle water will have come to a boil. Add a healthy pinch of salt and cook the buckwheat noodles according to package directions. Pull noodles out with a pair of tongs and apportion them into serving bowls. Ladel the soup / veggies over the noodles (discarding any gingers slices you come across - they've done their job). Add two halves of soft boiled eggs, reserved scallions and sprinkle of sesame seeds. Serve immediately. This post was sponsored by Presidents Choice PC Black Label. All opinions are my own. Thank you for supporting the brands that enable me to create new content for this site!